You probably don’t have wolves living in your backyard, but you just might have coyotes. These small wild dogs live all over the United States. They can adapt to many types of areas. They live in the desert, the mountains, the plains and even in cities. Coyotes are carnivores, but they eat fruit and vegetables too. In fact, they might even get in your garden to snack on berries or melons. 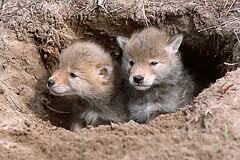 Coyotes raise their pups in dens or holes in the ground. Coyotes weigh only about 20 pounds, making them the size of a medium dog. They have long fur that is brownish red, grey or white. Coyotes have a bushy tail like a fox. They usually have two to four pups. Coyotes make high yipping sounds. These sounds get louder and faster when they close in on prey. A coyote’s yipping sounds a little scary if you’ve never heard it before. 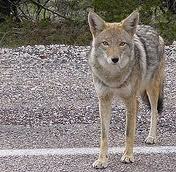 Even though coyotes look like dogs, they’re wild. If you see one, yell and back away slowly. 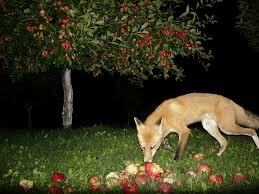 Coyotes are carnivores, but they eat fruit and vegetables too. A video documentary about the live of coyotes in the wild. Question: Do coyotes live in packs like wolves? Answer: Yes, but their packs aren’t as organized or as long lasting. Question: Will coyotes hurt humans? Answer: Not usually, but they are wild. They sometimes eat pets. Enjoyed the Easy Science for Kids Website all about Coyotes info? Take the FREE & fun all about Coyotes quiz and download FREE Coyotes worksheet for kids. For lengthy info click here.